Last week I recorded this video for the students at a university in India, who requested an update on Mozilla Labs projects. It’s about 20 minutes of me showing screens and talking about Ubiquity, Weave, Jetpack, and Test Pilot. Jetpack and Test Pilot are relatively new so I explain what they’re all about; for older projects Weave and Ubiquity I just highlight a couple of new features. Thanks to Asa Dotzler for doing the video recording and editing. Now I have a follow-up question for you readers. I’m trying to understand how bookmark usage patterns differ on mobile web browsing platforms. This issue has serious implications for the design of the bookmark UI in Fennec. It also affects the design of Weave. What should be the default Weave behavior when syncing bookmarks between desktop and mobile clients? The current behavior is to simply merge the two lists, so you have the same bookmarks in both places. But if there is a big difference between the bookmarks you want on one side and the bookmarks you want on the other side, then maybe pushing everything into one big pile isn’t the best approach. I must admit that I very rarely do any mobile web-browsing. 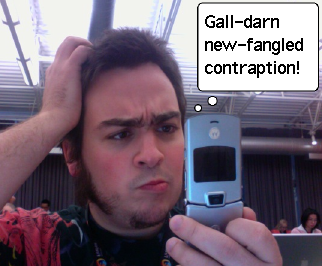 I have an old, crummy cell phone that I barely use. I take my laptop everywhere and do my web browsing on that. (I know, I’m behind the times.) In fact, the browsing I’ve done on my Nokia N810 in order to develop and test Weave on Fennec is about the most that I’ve done. That means that I have not developed the personal experience or intuition to guide design decisions about mobile browsing. Instead, I have to rely on data, input, and stories from others who do use the mobile web. Do you use bookmarks when browsing on a cell phone or other mobile device? If so, how does your bookmark use on mobile differ from your bookmark use on a desktop or laptop machine? If you don’t use bookmarks in mobile browsing, why not? Is it because of a poor interface, because your needs are different, or some other reason? Finally, is there a difference between the set of bookmarks you commonly use on the desktop, and the set of bookmarks you commonly use (or think you would use) on a mobile gadget? Do you think there’s a case for keeping these two lists of bookmarks separate? A CNet article about Fennec mentions Weave as the killer advantage that mobile Firefox will have over other mobile browsers. Yay! Thanks to Jay (who demoed Weave to the reporter) for the link. It made my day! Fennec Beta 1 was released yesterday! And there was great rejoicing! To go with it, we’ve released Milestone 5 of Weave, including a lot of bug fixes and UI polish improvements to the Fennec version, and an improvement to the caching algorithm that makes syncing up to 3x faster. 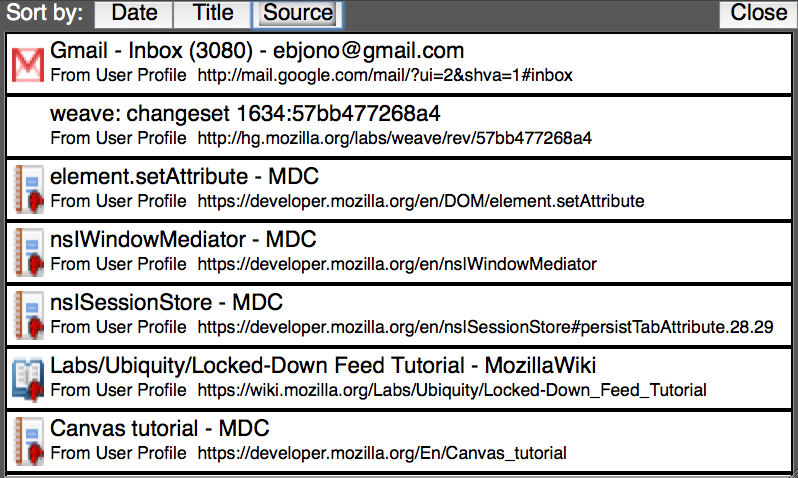 Weave is now hosted on addons.mozilla.org, so you can get it there. I wrote up a tutorial explaining how to install Fennec on an N810, and how to install, configure, and use Weave on Fennec, in case you’re interested in helping us test it out.